good hardware: tough steelcase, integrated power supply, high quality pots screwed to the case. the Cutoff pot’s range is not wide enough, the filter does not close (without Env Amount). If you adjust PR3 accordingly it does not open enough. Accent starts a veeery long decay for the Accent envelope. Eh? LONG?! It should be shortened! the worst: Glide is NOT engaged on legato notes but with CC # 65. Even that is implemented quite strangely: Glide will be activated if CC #65 will be decreased, starting with 127. It deactivates when increasing CC #65 starting with 0. No, not the extreme positions 0 and 127 are used, the moving-away-from-them changes the glide state. Strange. In the following all these issues will be solved and some more useful mods will come on top. The changes will not convert the DB9 into a TB303 but it will be much more usable and flexible afterwards. IMPORTANT SAFETY NOTE: CAUTION! The inside of the instrument has some potential deadly points and cables providing high voltage and current. Some of the insulation tubes have moved throughout the years. The Powerswitch on the frontpanel is also connected to dangerous voltages. The following mods should only be made by a professional! Keep the power cord unplugged when working inside of the DB9. I did not find any schematics for the DB9 and had to spend several hours for re-engeneering. 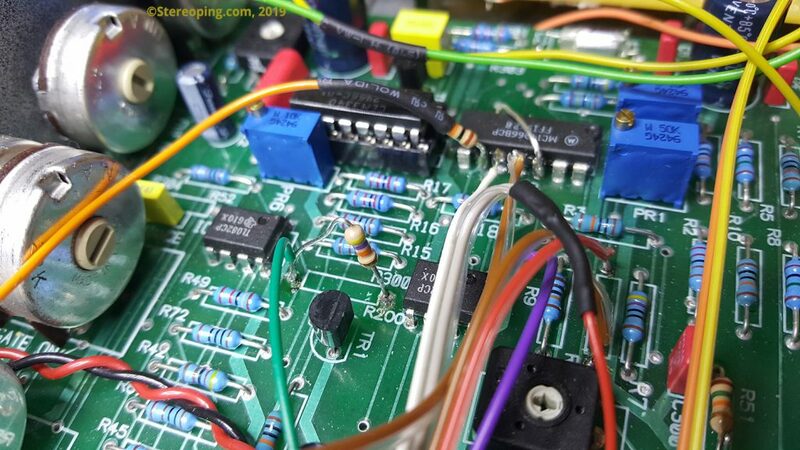 All i can offer is a highres photo of the PCB with some marked, important points and a rough PDF with my moddings. 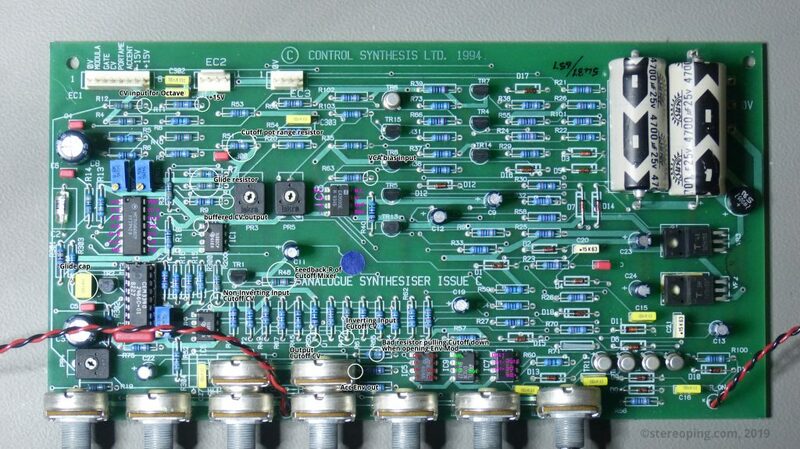 Nearly all mods (except PWM) can be soldered directly on the topside of the PCB. To have space for the modding pots the midichannel turning switch was taken out. 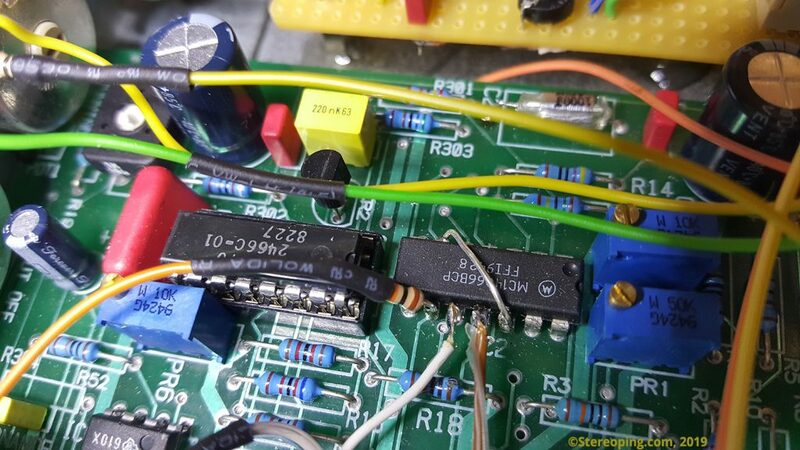 I fixed the midi-pcb-contacts to channel 9. Very easy: R51 leads the wiper of the Cutoff-Pot to the cutoff mixing point. I replaced the original 330k against 15k. The pot now ranges from completely closed to completely open even without any env-mod. If might be necessary to re-adjust PR3. R43 removed, R44 increased with another 47k. Turning up the Env Mod Potis does not only increase the envelope impact on cutoff. It also loweres the cutoff at the same time. I did not like that and completely removed R43 (150k) positioned to the right of the Env Mod Amount pot. To increase the impact of the mod wheel on the cutoff frequency you can lower R200. I changed it from the original 100k to 47k. As described above, ACCENT starts a very long (about 3 sec.) envelope changing cutoff. The reason is switch C of the 4066 pin 9 which leads the (one and only) Mod Envelope to an OpAmp input (IC 1 pin 5) while Accent is high. On the next non-accented note the OpAmp’s input is cut off and floating free. It takes some seconds for the OpAmps input to consume the charge and the output to come down to 0V again. This can be solved by pulling the OpAmp input/4066 output to GND over a 10k resistor. The Accent envelope then gets exactly the length of the ‘normal’ envelope. As this ‘error’ can sometimes be quite interesting i added a switch to decide if i want to keep the “Decay error” or fix it (by pulling the input to GND over the 10k). One of the typical 303 feature is shortening the modulation envelope to it’s minimal time on accented notes. We can add that feature to the DB9 quite easy. There is one unused analogue 4066 switch : switch ‘D’ on pins 10-12. They are unfortunaley all connected to GND, it’s easiest to cut their legs and bend them up. Switch B is already used for leading the Envelope through OpAmp1 to the ACCENT for accented notes. So we connect CTR B (Pin6) directly to CTR D (Pin12). The switch-pins 10 & 11 will be connected with the pins of the envelope decay pot to shorten them out with the 4066 for accented notes. That’s exactly what the 303 does. As i also like to have the option, so i added another switch to decide between long, default and short,303-like accent envelope. Also very easy: R1 (100k) will be replaced with a 1M log Pot. Variable glidetime. The DB9’s oscillator is a CEM3340 which got an input for voltage controlled pulsewidth. The PDF contains the schematic for driving the input (you can not simply lead 0-5 volt into the CEM). As it’s got a CV-mixer i also added an additional jack for driving the pulsewidth with a LFO e.g. Interesting: by default the PWM pin of the DB9’s CEM-chip is floating free. As a consequence the square waveform is NOT 50:50 but a tiny bit smaller. That’s why the squarewave misses the typical hollow square sound. The mod fixes that, by proper adjustment of P2 you will get the complete range from perfect 50:50 to 95:5! That’s also relatively easy. A voltage divider is buffered to get +1 volt. With an inverter of gain 1 we generate -1 volt. These voltages are soldered to the outer pins of a ON/OFF/ON switch. The middle pin will be connected over 100k to the right pin of R12. Why an ON/OFF/ON switch? Well, we want to have a switch position (in the middle) where the pitch is unaffected, right? I am a big fan of VCF keytrack. The cutoff frequency is altered by the pitch of the played note. With the option to switch it also to ‘negative’, VCF-tracking allows the ’emphasizing’ of lower notes as the VCF closes more, the higher the played notes are. 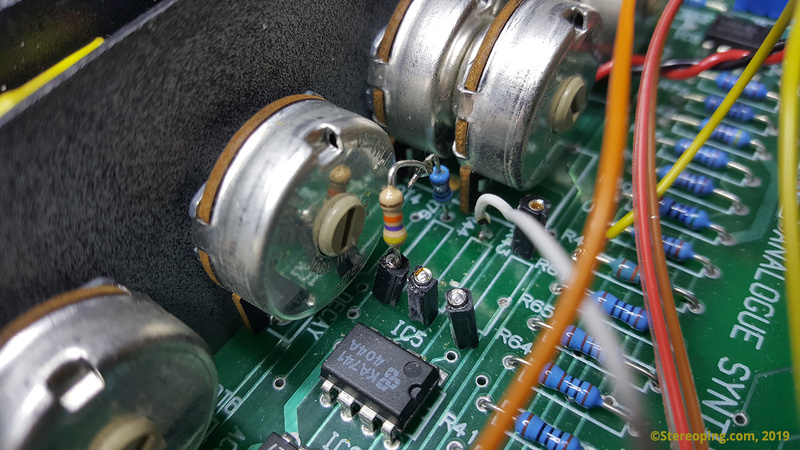 The mod is easy: The frequency control voltage from IC1 pin1 will be connected to a 10k lin pot (the opposite pin to GND naturally). The wiper is soldered over 47k to a flip switch’s centerpin. Both outer pins are connected to R200 and R47. Now we add Accent to the VCA. The Accent envelope (after the Accent pot) goes into the same schematics as in the original 303 to form a VCA envelope. The 3080 OTA of the DB9 behaves somehow different than the 303’s BA…. OTA, it did not work to just connect the envelope over a diode with the OTA’s bias input. 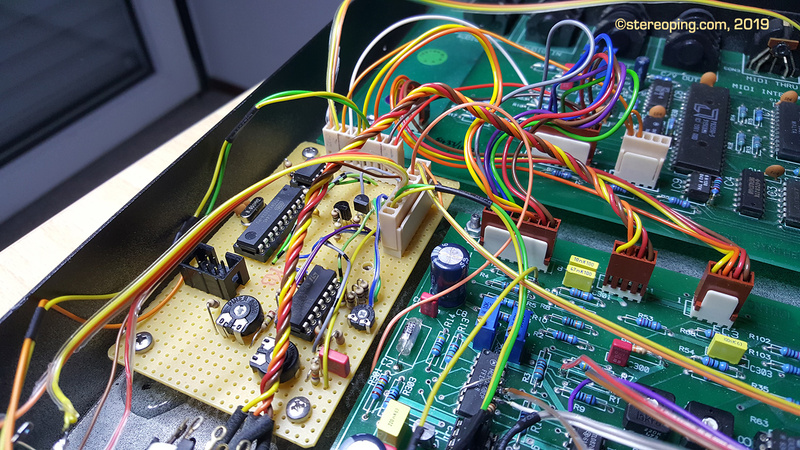 I therefore added a current converter, it’s output goes through a 470k log pot (for Accent VCA amount) and 22k directly into the 3080 bias input. The pot has to be soldered the wrong way to feel right. You might also try to find an inverse log pot. I wanted a separate “Accent to VCF” pot. Instead of connecting it’s wiper to the cutoff CV mixpoint it is sent through a 50k lin pot to a 1µ electrolytic capacitor. The wiper of this 50k pot goes to the cutoff CV summing point. Now depending on the wiper position of the 50k pot the accent envelope for VCF gets a tiny attack and generates the typical 303 ‘barking’. In the 303 this 50k pot is one half of the resonance pot. This is the most complicated part. By default the glide is engaged by these strange CC#65 changes described above. As there is no chance to change the midi interface’s behaviour we need a second midi interface generating the glide from legato notes. So i added a second optocoupler and a Tiny2313 microcontroller. It analyzed notes on channel 9 for legato notes and velocity above 90 to generate signals for glide and accent. It also got some pins left over to drive two LEDs for indicating glides and accents. The accent signal would not have been necessary as it works well with the DB9’s own interface. But i wanted to add another feature: as long as the notes C3, D3, C4 or D3 on channel 8 are held down, glide or accent will be ignored or forces. Means it affects all notes for momentary effects as long as the notes are held. No, it is still not a 303. 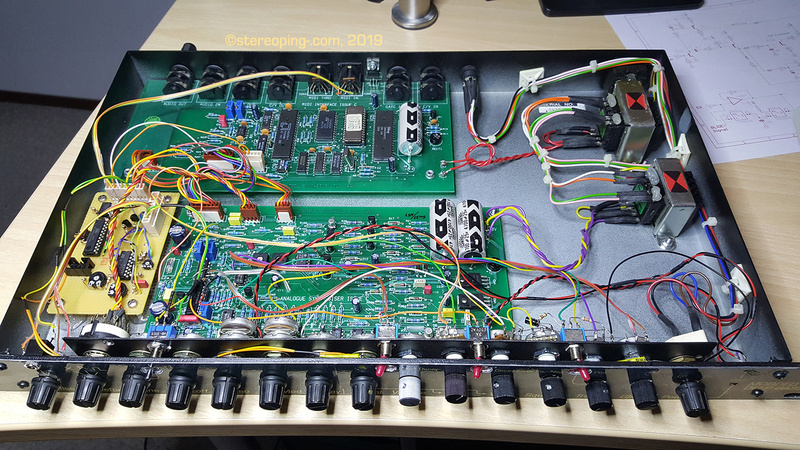 It misses the feature following accented notes to raise the cutoff frequency (.. the 5.333V mystery…) and it’s VCF is surely not a 303-vcf clone. Both would have needed much more effort and time.